Kim would put his troops on a "fully armed state of war" starting from 5 pm (0830 GMT) and had declared a "quasi-state of war" in frontline areas, reports said. North Korean leader Kim Jong Un ordered his troops onto a war footing from 5 pm on Friday after Pyongyang issued an ultimatum to Seoul to halt anti-North propaganda broadcasts by Saturday afternoon or face military action. Tension on the divided peninsula escalated on Thursday when North Korea fired shells into South Korea to protest against the loudspeaker broadcasts from the Korean border. The South responded with its own artillery barrage. Both sides said there were no casualties or damage in their territory. The North’s shelling came after it had demanded last weekend that South Korea end the broadcasts or face military action- a relatively rare case of it following up on its frequent threats against the South. Its 48-hour ultimatum to halt the broadcasts, delivered in a letter to the South Korean Defence Ministry via a joint military communications channel, was also uncharacteristically specific. A South Korean military official said the broadcasts would continue. The North Korean leader would put his troops on a “fully armed state of war” starting from 5 pm (0830 GMT) and had declared a “quasi-state of war” in frontline areas, Pyongyang’s official KCNA news agency reported. Some North Korean propaganda websites were not accessible on Friday morning. Pyongyang’s declaration of a semi-state of war was the first use of such terminology since the North shelled a South Korean island in 2010, the Yonhap News Agency said. Two South Korean marines and two civilians were killed in the incident. South Korea’s won currency and shares fell early on Friday as the heightened tensions added volatility to markets already hit by concerns about the global economy. 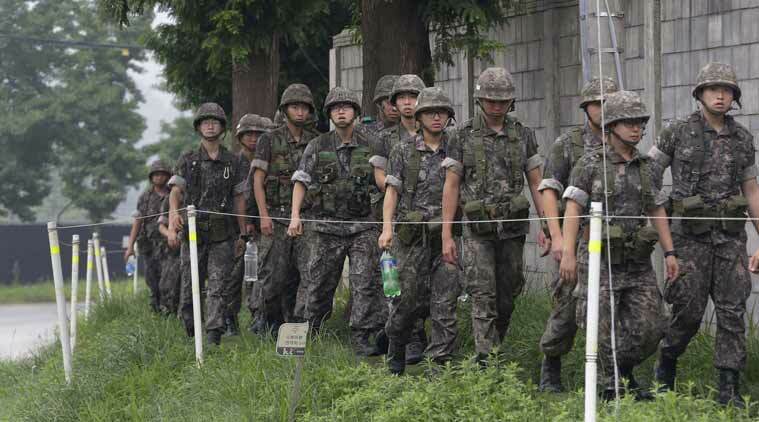 The US military, which has 28,500 personnel in South Korea, said it was closely monitoring the situation. “The safety of our personnel and families is paramount and we will take prudent measures to ensure their well-being,” it said in a statement without elaborating. Washington earlier urged Pyongyang to halt any “provocative” actions in the wake of Thursday’s exchange of fire, the first between the two Koreas since last October. Japan urged North Korea to exercise restraint. South Korea limited entry into an industrial park it runs jointly with North Korea, but the complex, seen as a barometer for the state of inter-Korean relations, continued to operate. “This is now a very grave situation. So we need to operate Kaesong Industrial Complex with necessary but minimum personnel,” said Jeong Joon-hee, spokesman for the South’s Unification Ministry, which handles inter-Korean affairs. The factory park, a few kilometres north of the Korean border, is the last significant vestige of cooperation from a Korean leaders’ summit 15 years ago. North Korea shut the complex for five months in 2013, during a period of diplomatic tension that followed a nuclear test by Pyongyang. Seoul began blasting anti-North Korean propaganda from loudspeakers on the border on Aug. 10, resuming a tactic that both sides had stopped in 2004. Tension between the two Koreas has risen since early this month, when landmine explosions in the Demilitarised Zone (DMZ) of the border wounded two South Korean soldiers. Seoul accused North Korea of laying the mines, which Pyongyang has denied. The incident prompted Seoul’s propaganda broadcasts. North Korea on Monday began conducting its own broadcasts. Thursday’s exchange of fire took place during annual joint US and South Korean military exercises, which Pyongyang frequently condemns as preparation for war. Daniel Pinkston of the International Crisis Group think tank said the large presence of US troops in the South for the exercises could reduce the risk of escalation. “This is a bad time to pick a fight with the South while it has all these resources there,” he said.